Dit roept Darren Cassey van CarThrottle en legt ons uit hoe hij tot deze conclusie is gekomen. My first experience of the RS was point and squirt dual carriageway miles. Initially, I was a little disappointed by the way the RS pulls from the bottom of second through third as I exited the many roundabouts breaking up the monotony of the A34, as it wasn’t as whip crack fast as I was expecting. The slightly more powerful (and £10k more expensive) Audi RS3 does a better job of pinning you to your seat during mindless roundabout throttle mashing sessions, but unlocking the Focus’s talent requires much more finesse. Ditching main roads for twistier and often badly paved back roads gives the Focus the chance to shine. You quickly find yourself learning to trust the car to carry more speed than should be possible, both by the laws of physics and the kind of laws police officers enforce. I’ll get into the specifics of how and why below, but suffice to say I’m not sure anything else I’ve driven could keep pace with the Focus RS over these sorts of roads. The only car that could get close would be the Audi R8 V10 Plus, which has near enough twice as much power. 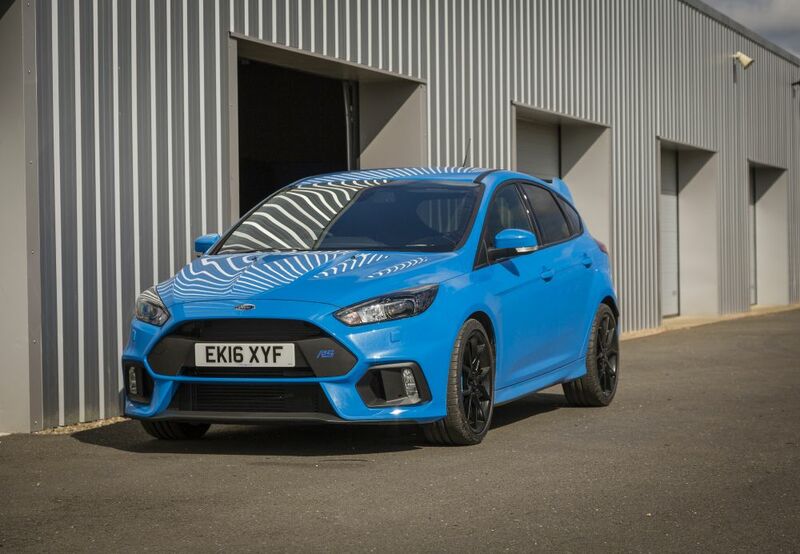 It’s similarly unruffled by terrible road surfaces, but the fact it feels so wide means you’d be holding back in places where you’re comfortably pushing on in the Ford. The Audi would have it pegged on the straights, but point-to-point I’m confident you couldn’t shake the blue five-door from your tail. For me, the key reason you’re able to carry so much speed on the road is down to the suspension and damping. 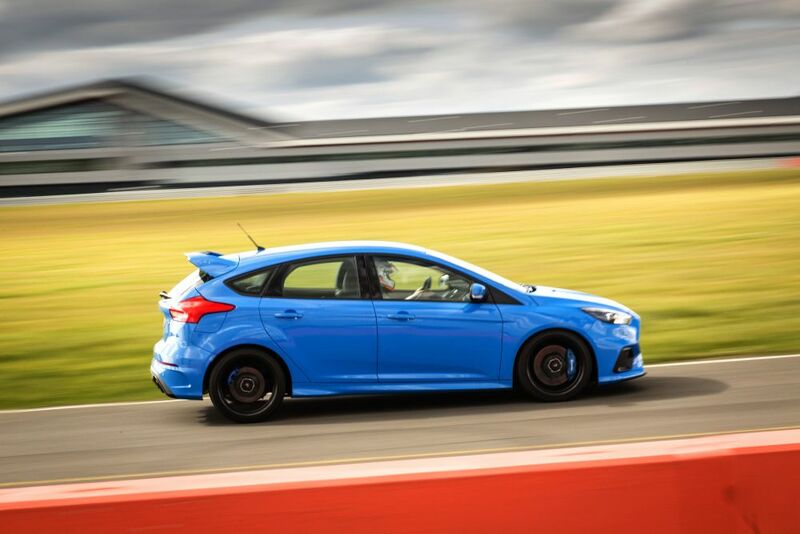 The RS gets suspension that’s 33 per cent stiffer at the front and 38 per cent stiffer at the rear than the ST, and in Sport mode the damping is perfectly judged to keep the car planted without banging and crashing through rough tarmac. In many performance cars, the trade off for gut-wrenching cornering ability is that your spine knows about it every time you hit a bump, but with the Focus you get a brilliant compromise. In their normal setting – for when you’ve selected the Normal or Sport Drive Modes – the dampers allow you to keep pushing on as they soak up lumps and bumps without unsettling the car’s balance, while the stiffer suspension and increased stiffening throughout the chassis ensure you don’t have to push through body roll as a consequence. It’s not as communicative as more focused machinery such as the Renaultsport Megane 275 Trophy R (with the trick Ohlins dampers), but there’s enough there to give you the confidence to go irresponsibly fast. Ford is rightfully pleased with its all-wheel drive system. Instead of the typical Haldex system used by the likes of Audi – sorry to mention it again, but when we’re talking performance AWD machines, quattro really is the benchmark – it uses ‘Dynamic Torque Vectoring’ to distribute torque to the wheels that’ll power you out of a corner fastest. 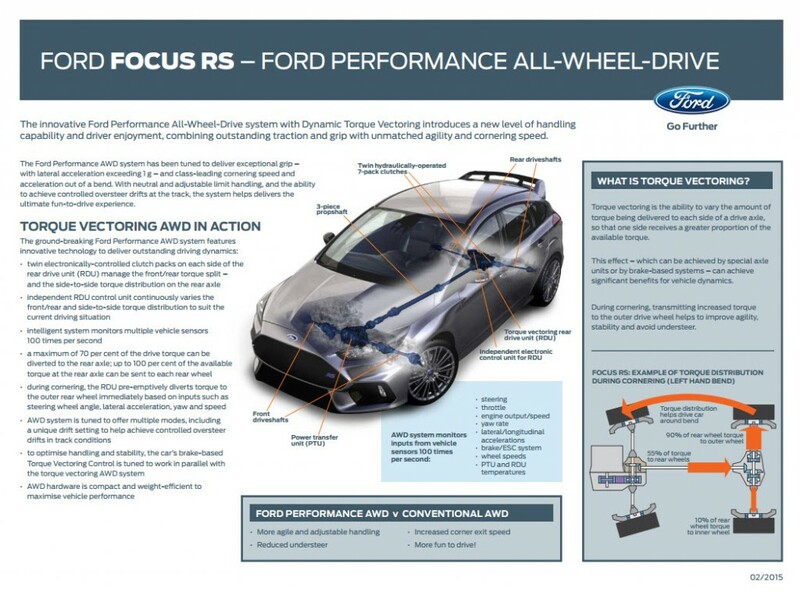 The system was originally used in the Range Rover Evoque, and Ford tried it out for the RS; since the RS’s rear axle was geared to rotate faster than the front to give the car a rear-driven urgency, that system couldn’t cope, so Ford went to town and made the setup work in a performance application. Twin-electronically-controlled clutch packs sit on the rear axle, which manage the front to rear torque split and the side-to-side torque distribution to the rear axle. About 70 per cent of power is typically the maximum amount sent to the rear tyres, but Ford Performance’s vehicle and engineering manager, Tyrone Johnson, said that they’ve recorded more than 95 per cent of power being diverted rearwards, emphasising the team’s commitment to giving the car a rear-driven feel. And you notice it. In Sport mode out on the road this manifests itself as a lack of understeer, with the car feeling neutral as you throw it around. Under hard acceleration in lower gears you will notice the car being pulled aside by road cambers a little, but it’s easily containable. Put the car into Track mode on circuit, though, and you really notice its rear bias. At Stowe, you could genuinely feel the rear rotating the car as you powered out of the two hairpin bends. What’s most impressive is the fact that you don’t feel the power being distributed. Audi’s quattro system is cool because you’re aware of the torque being shifted around beneath you, which feels a lot more raw. 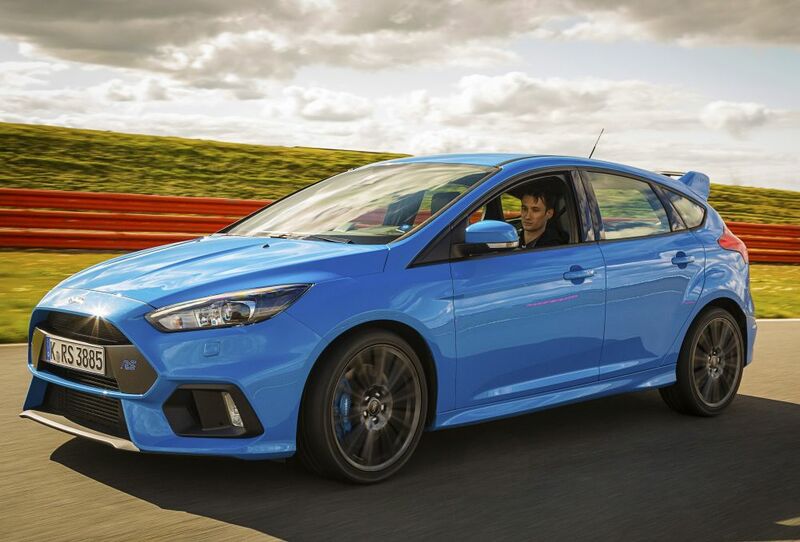 While it’s nice to feel that communication, in the Focus RS the power is just there. No fuss. That adds to the reassured feeling powering out of corners, and aids the car’s impressive balance. Often when manufacturers include drive modes that alter the way the car behaves, they either don’t do a lot, or don’t really change things for the better. 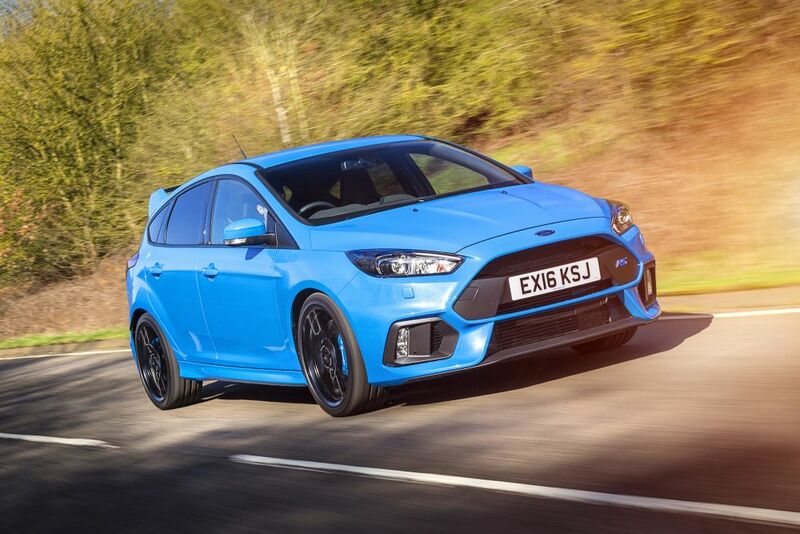 The Focus RS has four modes – Normal, Sport, Track and Drift. Normal makes everything fairly light and subdued, while Sport mode is perfect for on-road hooning. Track and Drift are both for track only, and make the car a little nervous when you’re not at a circuit. The genius of the different modes is that if you use them as intended they actually vastly improve your experience. Sport mode makes the RS feel a lot more urgent without making it jittery, which means you have confidence to go mad with your right foot. Put the car into Track mode on circuit, and it feels much more alive. The car feels instantly more agile and rear-biased, allowing you to rotate the car out of a turn. 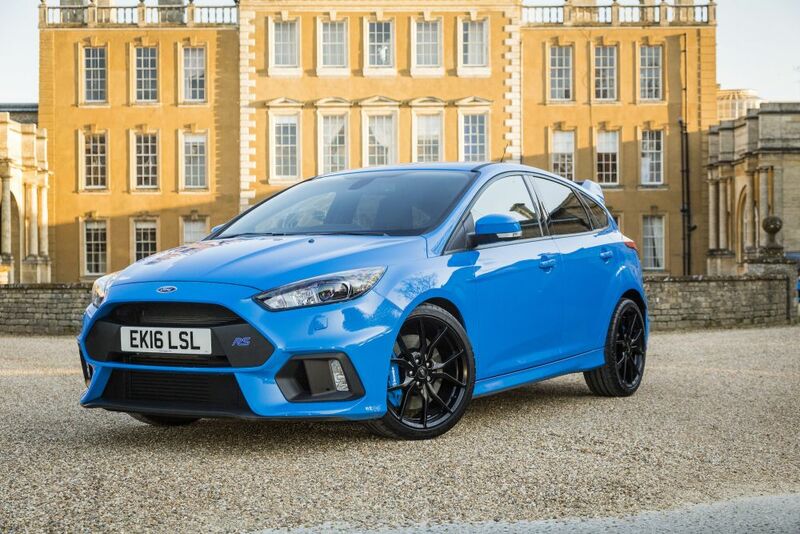 The Focus RS gets Ford’s 2.3-litre EcoBoost engine as found in the Mustang, but here it’s been reworked to produce 345bhp. Engage launch mode – a process which isn’t as quick and easy to as you’d want it to be – and you’ll hit 62mph from a standstill in 4.7 seconds. Off the line acceleration hits you like a punch, with none of the slip found under hard acceleration in the RS3. Accelerating up through the gears in a straight line isn’t particularly exciting, and while Ford has spent plenty of time tuning the noise that the engine and exhaust make, you won’t fall in love with either the delivery or the sound. Forget about straight line performance though, and keep it in third gear through the curves, and you’ll start to gel with the lump up front. The gearing is such that third is generally all you need, and you can ride the surge of power even from fairly low revs right up to the growling red line. The shift is solid without being memorable, so you’re not missing out on a huge amount by not rowing through gears. Instead, zone in to the ebb and flow of the road and enjoy the way the car obliterates the ground beneath it. Nothing’s perfect, but aside from the Drift mode failure, the Ford Focus RS is pretty damn close. It feels a little heavy as most all-wheel drive performance cars do, but the rear bias does help to mask this better than its rivals manage. 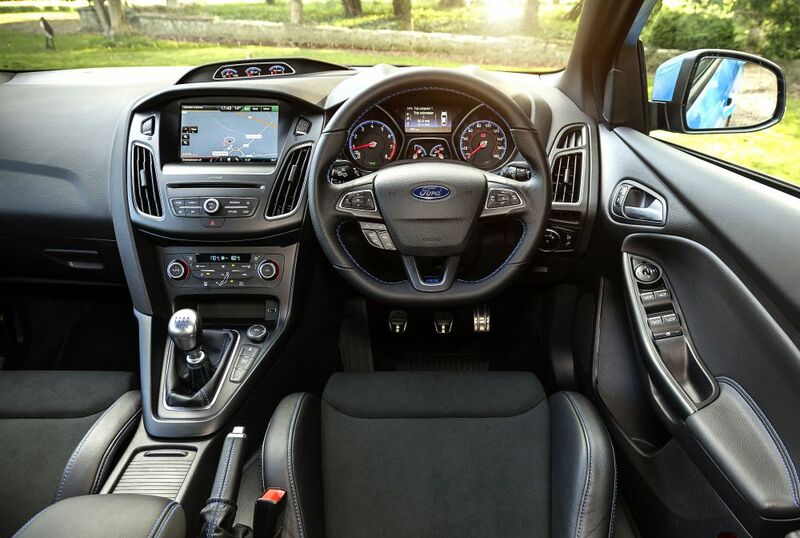 I’m also not a huge fan of Ford’s instrument cluster menu screens, as the design has been outdated for years and navigating has always felt slow and clunky – finding Launch Control is only five button presses, but since you have to wait for each click to register it feels like an eternity. A classic Focus complaint is that the driving position is a little too high, and that argument could still be levelled at this RS, although it seems less obvious than before, particularly if you go for the full bucket seats, which cocoon you nicely in place. 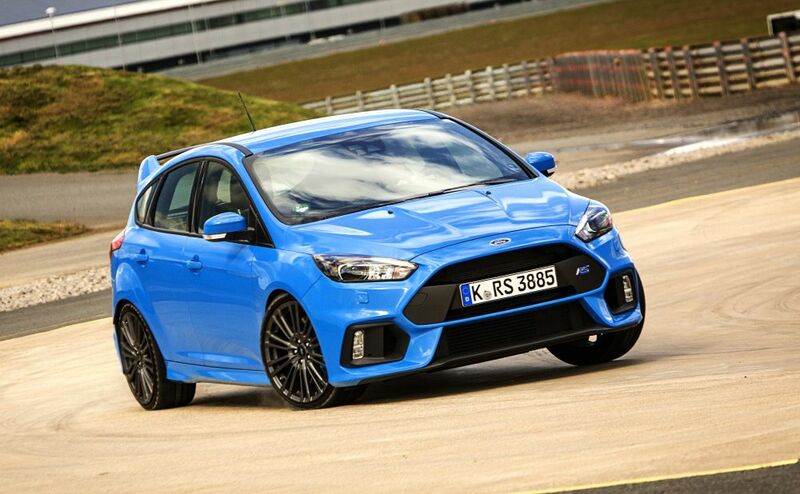 Overall, the Ford Focus RS is an absolutely fantastic machine. It somehow manages to ride the line between being a battering ram while still requiring finesse to extract all of its epic performance. At £31,000 base price it’s an absolute steal – I rarely feel this about modern cars no matter how much I adore them, but if I had the cash I’d put my name to one immediately. And if you knew how tight I am with money, you’d know that that’s very high praise indeed.